Brindle pit bulls, a member of the American pit bull breed, are definitely handsome, but not all that rare. The only thing differentiating him from other pit bulls is his coat color. However, these beautiful brindles have some interesting genetics leading to their colorful coats. Pro tip: if a breeder is seeking extra money because his brindle pit bull is "rare," consider finding another breeder who is either more knowledgeable or more ethical. No matter what kind of coat he has, the pit bull is usually an affectionate dog. You'll know a brindle coat when you see it -- a mixture of colors resulting in a mottled appearance or streaks in the fur. Brindle patterns vary widely, with black, brown, fawn, white and red common among the coat colors. A dog may be a "heavy" brindle, meaning his appearance is darker in color, or he may be "light" brindle, with a lighter color. To understand how a dog's coat gets a brindle pattern, think biology. Each dog has 78 chromosomes, receiving some genetic makeup from his mother and some from his father. Genetic traits are located on specific parts of the chromosomes, known as the loci. The range of possible combinations on a locus is called an allele. When it comes to making a brindle coat, a recessive gene on the K locus needs to be expressed. The A locus is also involved, determining how much brindling appears on the dog's coat. Usually, brindle appears as black stripes on a red coat, and the stripes are actually pigment: eumelanin for black and phaeomelanin for red. The base pigment -- phaeomelanin -- is affected by the intensity locus, which can range from deep red to light cream. The eumelanin, or striping pigment, is determined by dilution, liver, merle, greying and recessive red. Though the brindle coat is caused by a recessive gene (and some complicated genetic science,) it's not rare. 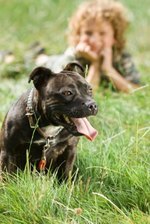 The United Kennel Club recognizes a brindle coat in a pit bull, but it does not recognize a merle, or splotchy coat, which is not natural to the pit bull. It takes a dominant allele to produce a merle coat, and pit bulls only have recessive alleles for merle. A pit bull with a merle coat would be the result of crossbreeding with a breed that carries the rare merle gene. Though a red or blue nose on a brindle pit bull may make him all the more handsome, it doesn't make him rare. Sometimes, when the genetics are just right and the genes come together on the E locus, he'll sport a black mask with his brindle. One important fact to understand about the pit bull is that he is not his history. 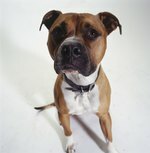 Traditionally the breed was used violently, for fighting and taking down large game, leading to the pit bull's current reputation as an aggressive dog. On the contrary, an American pit bull is an affectionate dog who loves to be around people. His prey drive may make him dangerous to small animals including pets; however, he tends to get along with full-size people, making him a poor watchdog. He has a high energy level, thriving when he gets between 30 and 45 minutes of vigorous exercise a day, and he responds well to positive training. Pit bulls are generally healthy dogs who can be prone to cataracts, allergies and chronic hip dysplasia. They enjoy life spans of around 12 years, and with training they will make loyal, lifelong companions.